Sea Kayak Safety is a comprehensive guide covering all aspects of safety skills and consideration for sea kayaking. The DVD's format enables the viewer to access relevant information quickly, making it a fantastic resource for both instructors and recreational paddlers alike. In making this DVD, Rock and Sea Productions worked with both B.C.U. and American coaches to give paddlers from all over the world a non-prescriptive insight into the many different perspectives of this challenging sport. 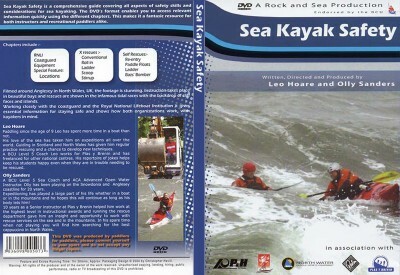 The format of Sea Kayak Safety allows the viewer to quickly find relevant information through the DVD chapter options, and each rescue technique is divided into 3 separate parts to reinforce the learning experience. The rescue technique starts with coaching on flat water, shown from different camera angles. The same rescue is then shown on rough water so the viewer can see how it is done in a real live situation. The final sequence shows the rescue again, but this time the action is frozen and illustrated with bullet points at crucial moments. Sea Kayak Safety also has a special feature, LOCATIONS, which provides an interactive map of North Wales showing where the spectacular scenic footage captured in Sea Kayak Safety can be found.